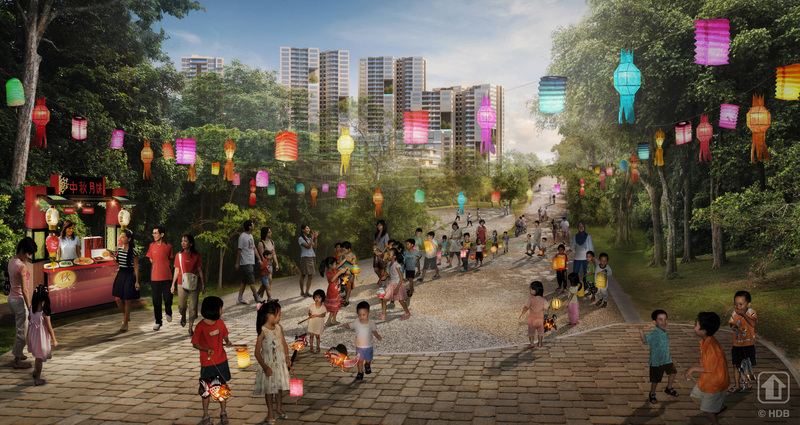 Artist’s impression of old Punggol Road heritage trail. Image courtesy of the Housing & Development Board. Illustrations are artists’ impressions only. Actual developments may differ. Punggol has come a long way from its days as a village where poultry, pig and vegetable farms were located. Over the years, it has become a vibrant new town with distinctive districts, each with a unique identity and character. Throughout its transformation journey, it has kept elements of its rich heritage through the retention of historic landmarks, as well as the design of new infrastructure and features that draw inspiration from the area’s history. An important historic landmark is Old Punggol Road, which used to be a key transportation route for farm and fishing goods, serving the many farms and kampongs in the area. A short stretch of Old Punggol Road has been pedestrianised into a heritage trail within the existing Punggol Waterway Park. Some interesting features along this trail include the Kelong Bridge, a heritage wall and an old bus stop. The remaining stretch of Old Punggol Road leading to Punggol Point will be progressively pedestrianised and kept as a heritage trail for leisurely strolls, jogging and cycling. The heritage trail will also be integrated with adjacent developments, such as the future Singapore Institute of Technology campus in the Punggol Digital District and residential developments and schools in Punggol Point District.